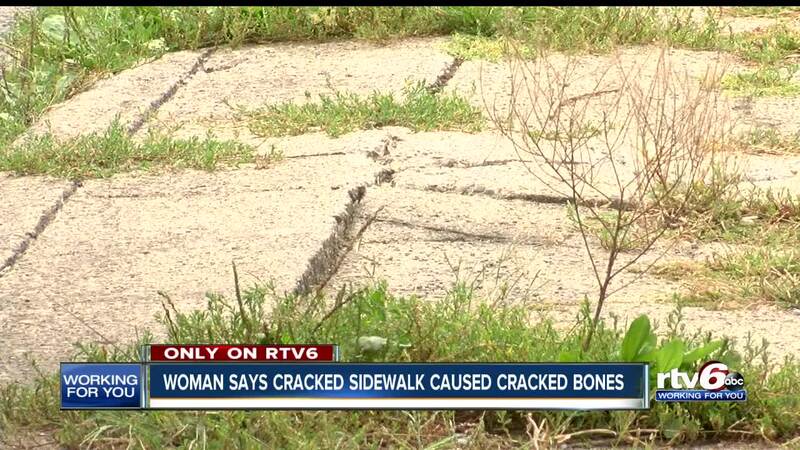 A man reported his damaged sidewalk to the city. A year later, his wife broke her arm falling on it. INDIANAPOLIS -- A year ago, Raymond Whyde filed a service request to get a sidewalk outside their east side house fixed. His wife Tina tripped on the cracked sidewalk last week, breaking two bones in her arm that required two metal plates and a three-hour surgery. "I'm asking that the city take care of our sidewalks and our curbs in our neighborhood," Raymond said. A spokesperson with the Department of Public Works said a service request was made for the street near the 1400 block of Grant Avenue in 2017. The Whydes say they have started the process of filing a personal injury claim with the city. "It's the sidewalks that make the area trashy and nobody wants to even come around," Raymond said. For the time being, they will avoid the sidewalks in front of their house, choosing instead to walk in the street. You can make a request on the RequestIndy portal here , or by calling the Mayor's Action Center at 317-327-4MAC.